Have you finally decided to quit smoking? I'll introduce you the app which probably may help you in achieving this not so easy goal. At least it will remind and summarize for you regularly how good is it to be smoke free just in order to keep you permanently fit. This Health&fitness free app called Quitter is developed by Paze. 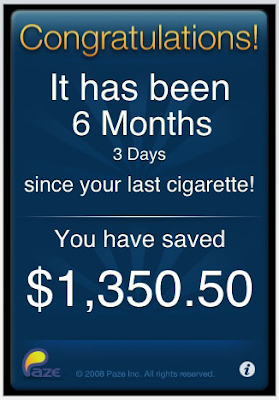 The advantage of this application consists in its aptitude to count you the sum you've saved and the number of cigarettes you abandon each day by quitting to smoke. Of course you should fulfill the latter by all means otherwise the app doesn't make sense. Perhaps you've been expecting something more but bearing in mind that the app is free you might find it quite enjoyable by considering how much money and health you've been saving by quitting this gruesome habit. If you're interested and think that Quitter will make a good deal for you then go ahead and download it for FREE at the iTunes App Store.